Sky Blue Topaz Pendant – Topaz Jewelry. This is a small silver & blue pendant in sterling silver with a round faceted Topaz gemstone, sky blue in colour, set in a sterling silver collet. 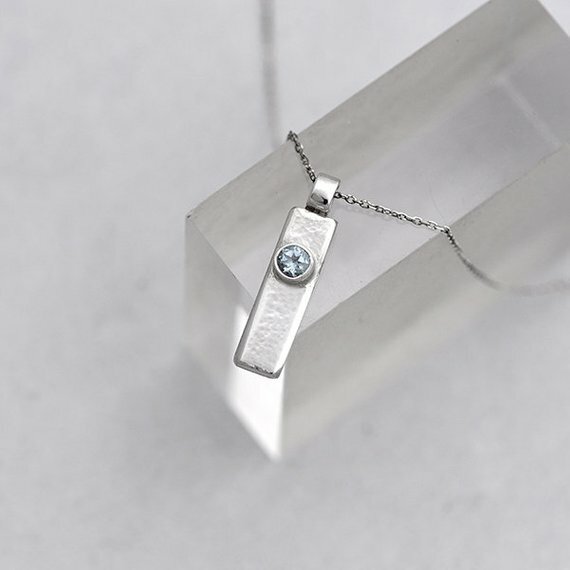 This rectangular blue Topaz pendant has a subtly hammered finish. The perimeter has a subtle beveled edge which catches an extra glint of light around the perimeter. * Boxed, ready for presentation or ease if gift wrapping. We enclose a card and/or a message upon request. * Handmade to order – You’ll receive a pendant like the example in the photos, dimensions as a guide. Copyright © iana Jewellery 2019 / Theme: EleMate, designed by WPDevHQ.